2014 Mercedes-Benz CLA Pros and Cons: Why (Not) This Car? By now you've seen the ads: a stylish Mercedes for $29,900. For the new CLA-Class, Mercedes took its recently redesigned A-Class (never offered in North America), added a trunk, and styled it to resemble the CLS "four-door coupe." But can you have it all in this car--prestige and style at a surprisingly affordable price? Or has Mercedes ventured too far from the characteristics that have made its cars so desirable, and sold its soul to the devil in pursuit of more buyers? But what car should I compare the CLA250 to? Audi won't offer its competing new A3 sedan until next year. There's no telling when we'll see a 1-Series sedan. For better or worse, the most similar car I've driven recently is the Acura TSX. Sporty interior overall, but the shifter is on the column and some parts seem low rent. Why the 2014 Mercedes-Benz CLA? For all of its missteps in the past two decades, Mercedes remains Mercedes. If you're over 40, Audis and BMWs probably don't have quite the same image, even if you prefer the cars themselves. Volvo is clearly of a lower rank. Acura is lower still. The German luxury car manufacturers have been achieving some shockingly good fuel economy figures in the last few years. 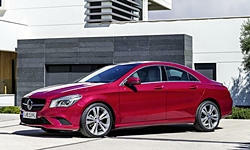 To these we can add the CLA250's EPA ratings of 26 mpg city and 38 mpg highway. To do better in a car with 208-horsepower and 258 lb-ft of torque, you need a hybrid or a diesel. Mercedes-Benz's own C250, with a less powerful engine, manages only 22/31. As does the Acura TSX. Among likely competitors, the 180-horsepower BMW 320i comes closest to matching the CLA, with 24/36. Should Jaguar demand royalties? The CLA's most elegant angle. Some people aren't fans of the non-integrated screen. Personally, I find the CLA's combination of a tall squared-off nose with drooping hindquarters awkward. (It looks better in these photos than in person.) But I must grant that the car's exterior appearance is bolder and sportier than that of its competitors. I don't doubt that many people will buy a CLA because they love how it looks. The CLA, the first front-wheel-drive car Mercedes has offered in the U.S., drives little like the similarly sized but rear-wheel-drive C-Class. To begin with, the new car is much more fun to drive. It feels considerably lighter and more agile. Its steering, though light, seems quicker and more direct (i.e. less vague) than that in other Mercedes. Partly this is because the CLA, at 3,262 lbs., is 166 pounds lighter than the C250. The CLA handles well considering which wheels are driven, with minimal understeer (until you approach the base tires' modest limits) and decent body control. But the sense that most of the car's weight is with its drive wheels in the nose never goes away, and you can't adjust the attitude of the chassis with the throttle. As much as I don't care for the softer tuning of the latest 3-Series, it does retain the advantage of rear-wheel-drive dynamics over the CLA. The Acura TSX and Audi A4, front-wheel-drive like the CLA, also handle well, but feel more substantial (a good thing for those seeking a premium feel) and less agile (not so good). Though the Acura's steering is quick, it provides little in the way of feedback. Okay, about that $29,990 price: you're not going to find it on a Mercedes dealer lot. To begin with, this heavily advertised price doesn't include the mandatory $925 destination charge. Also, most cars will be optioned, like the one I tested, with nav, xenon headlights, a large sunroof, and wood trim. Ignore the optional spoiler ($300) and add metallic paint ($720), and the sticker ends up at $38,870. Want leather in your upscale car? That'll be another $1,500. All-wheel-drive? Another $2,000. It's probably best to think of the CLA250 as a $40,000 car, not a $30,000 car. Even so, this does put it about $5,500 below a C250. The BMW 320i introduced to head off the CLA? It's about $4,000 more. (And you can't get a premium audio system in the 320i to match the 450-watt Harman/Kardon system included in a comparably equipped CLA.) Even a Volvo S60 is about $2,500 more expensive. The Acura TSX, on the other hand, lists for $5,415 less. (I've added leather to the CLA since it's standard on the Acura.) But adjust for the CLA250's additional features, and the gap shrinks to about $2,200. Will people pay $2,200 more for a Mercedes than for an Acura? I have a hunch that many will. Why Not the 2014 Mercedes-Benz CLA? Now for the downside of not feeling like a traditional Mercedes: the CLA250 doesn't inspire comparisons to granite and metal ingots the way even a C-Class does. Though not too firm, at least not for anyone seeking a sporty car, the CLA's ride is less polished and insulated than in other $40,000 compact sedans. It feels more like a run-of-the-mill car. Aside from not providing a feeling of solidity, the CLA is noisier and less refined than other four-door Mercedes. Some blame might be due the frameless door glass, which has a tendency to seal less well and shake more over road imperfections. Also, the dual-clutch automated manual transmission (similar to VW's DSG) whines more than any I've experienced in recent memory. The CLA's interior materials largely look and feel like the hard plastic they are. The center console and air vents in particular appear to be victims of cost-cutting. A darker interior might help, as might the upholstered instrument panel that's bundled with leather seat surfaces. The tested car included neither option. While you'll find nearly as much hard plastic in the other cars (including the C-Class), it tends to look and feel of higher quality. A big star leaves no doubt as to the brand. A dealer-installed accessory can make it glow at night. Just enough space for me to squeeze behind my 5-9 self. Few four-door cars are tighter in back. Mercedes would prefer that you think of the CLA not as a sedan but as a four-door coupe. Not only are coupes more stylish, but they invite lower expectations of practicality. In the case of the CLA, you sit much lower (both front and rear) relative to smaller windows than in the C-Class. The view forward from the firm, narrow driver seat isn't nearly as expansive, while rearward visibility renders the optional rearview camera a must-have. You'll find something of the same difference comparing the CLS to the E-Class. The most direct competitors, being sedans, provide better outward visibility. The CLA's rear legroom stat, a very low 27.1 inches, suggests that adults won't even fit in back. But this stat under-represents reality. At 5-9, I could just manage to site behind myself. More than the limited amount of room, I minded the highly constricted view out. The coupe-like roof line takes a big cut out of the rear side windows. Unlike in the C-Class, the front seats largely block rear seat passengers' view forward. Suffer from claustrophobia? Best avoid the CLA. But, it's a coupe, so what did you expect? With a 208-horsepower turbocharged 2.0-liter four-cylinder engine to move 3,262 pounds, the CLA250 is fairly quick, if not thrillingly so. Mercedes claims the car will get from zero to 60 mph in just under seven seconds. This seems about right. But the transmission, while enabling this acceleration and the outstanding fuel economy mentioned earlier, doesn't behave well. A seven-speed dual-clutch automated manual, it delivers neither the lightning-quick shifts of Volkswagen's DSG nor the refinement of the conventional automatics found in most competitors. In my brief time in the car I played with the different modes, but couldn't get to a place where the transmission decisively and unobtrusively went about its business. Maybe once we spend more time getting to know each other? In quite a few ways the new Mercedes-Benz CLA250 surprised me. In ways both good and bad, it drives very differently than other Mercedes, even the similarly compact C-Class. More agility and efficiency, but less solidity and functionality. Does this tradeoff extend or threaten the Mercedes brand? Probably both. While few CLAs will sell near the $29,900 advertised price, it does undercut nearly all of its most likely competitors. And it isn't much above the others. Even with the CLA250's shortcomings, Mercedes will likely score the additional sales it's aiming for. For anyone who wants a compact Mercedes that drives like a Mercedes, they'll still have the C-Class. A healthy midrange. Let down by a poorly behaved transmission. At 13 cubic feet, the CLA's trunk is more competitive than its rear seat. Magic? Just no spare tire. Eric Wheeler of Mercedes-Benz of Novi (MI) helpfully provided a CLA250 for a test drive. He can be reached at 248-426-9600. 2014 Mercedes-Benz CLA pros and cons, according to Michael Karesh: the best reasons for buying (or not buying) the 2014 Mercedes-Benz CLA. Join TrueDelta to post your own impressions. I own a 2015 CLA 250 which I purchased new. I have had no issues with it ( 31,000 km ) and have never returned it to the dealership other than scheduled maintainance. I've gotten over 50 MPG on the highway and usually 35-36 city driving ( FWD model ). Acceleration is fantastic for just 208 HP and that is in ECO mode. I am seriously considering purchasing a new model when my 4 year warranty runs out. Best car I have ever owned.